Experience the smoothness and power of a Team Daiwa HardBodyz reel at a very affordable price.The ultra-slim body is crafted of rigid aluminum to keep the DigiGear digital gears perfectlymeshed and functioning smoothly, and the 8-bearing system includes advanced 3 CRBB (Corrosion-Resistant Ball Bearings) to fight off corrosion over the long term. The unique design of the ABS aluminum spool maximizes casting distance, while the tubular stainless Air Bail functions flawlessly to lay line on the spool evenly on every cast. Sealed, waterproof drag; Infinite Anti-Reverse; Gyro Spin balancing; Twist Buster line twist reduction. FREE aluminum spare spool. "this reel should be in the $40 or $50 range. then i would reccommend it to a friend. mine has less than 20 hrs. of use. the handle has fallen off this reel 4 times. the pin will not stay securely in the handle. this is a very poor design on a $120.00 reel." "I plan to get a 4000 soon.I target speckle trout, redfish, flounder, blues and spanish, with king mac's last. These reels have the power and the drag is so smooth, landing upper slot drum to 27inches no problem, I have had no problems with these reels, used them for two years, I use braid on all of these reels." 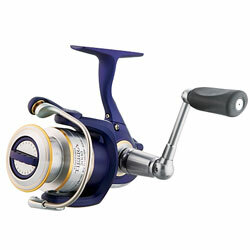 "I would recommend anybody from either fresh or saltwater to purchase this incredible reel. I've had it now for about 4 months and im really satisfied. So far it handled mackeral, big bass, carp, snook, tarpon, and backwater redfish. Im really happy that i purchased one." "The Tierra reel is by far the best reel for the price. I own 5 of these bad boys 1-2500, 3-3000's, 1-4000 models. I have braid on all of them and can cast a plug a mile. There light weight which makes them easy to cast all day long. Strong enough to turn big reds and snook."